This card is being submitted to several challenges: WT283, Shabby Tea Room #22, Craft Your Days Away #1 and Party Time Tuesdays #11 (PTT). I used several embellisments and all seem to come together quite nicely. One is to use buttons, another to "reflect" (I thought of reflecting as in a slower time), another to use your favorite things and another a birthday card (thought of "Enjoy the ride" here). This card was fun to make and I didn't realize just how many different things I had used on it until trying to describe it here. The clouds were die cut from white felt and have Star Dust Stickles outlining the edges. The smaller cloud was raised on foam adhesive. 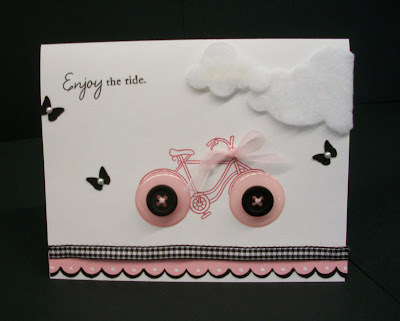 A cute tiny pink sheer ribbon grace the handlebars. Glossy soft pink "Tiles" were used as the tires with black buttons and light pink floss. The little butterflies (with tiny self adhesive pearls) are grabbed all the time as this is my favorite thing to use and were randomly placed. A double scallop border of Pretty in Pink (with white Gel pen dots) and layered on the black scallop piece and was placed on the bottom. A small strip of black and white checkered ribbon graced the top edge of the border piece. I love this sentiment for a birthday card and the little bike reminds me of slow, easy days gone by. The little black/white ribbon is a tiny bit "bumpy" due to the mini glue dots but is not as wrinkly or tacky looking as it appears here. Hope you like it. Other: MS Butterly punch, SU Scallop punch, PTI Cloud die, Star Dust Stickles, light pink Tiles, black buttons, light pink floss, Kaiser pearls, pink sheer and black/white checkered ribbons, White Gel Pen and foam adhesive. Super cute! Love the clouds and the button wheels. Thanks for sharing with us at Party Time Tuesdays. How very sweet this is! I love that bicycle with it's button wheels, and the felt clouds and butterflies are wonderful, too. Thanks for sharing this with us at TSTR. This is absolutely adorable Robbie! I love the clouds and the pink bike! Adorable!! Your card would also qualify for Flutter By Wednesday! Thanks for partying with us this week at Party Time Tuesdays!! A beautiful card, love the buttons. Thanks for joining us at CYDA and good luck. Awww, a fabulously fun card. I love the buttons for wheels too. Thanks for joining us for our first challenge at CYDA. I hope you come back and see us again soon and good luck.